I’ve always messed with Dialated Peoples from day one. I remember the first time I heard them, I was hosting Morgan State’s radio show “Strictly Hip Hop” and ALL of the dj’s used to play “Work the Angles” ALL of the time like clock work. And that song in my opinion embodies what Dialted Peoples is about. Dope beats, dope lyrics, and ill scratches. And THAT’S the kind of hip hop I run with, not this new wave stuff cats be calling classics in the first 48 hours of it dropping. And most folk don’t even peep how Dialated is one of the few hip hop groups that branch off and do solo projects that are just as dope as their Dialated albums. 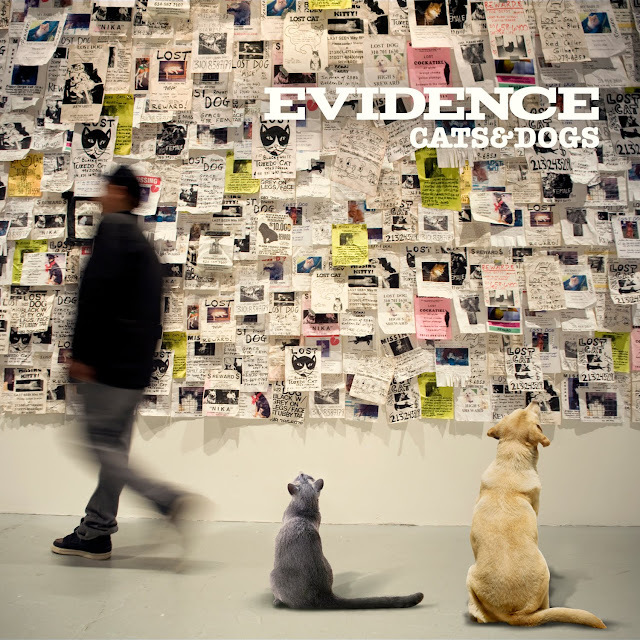 (see Evidence’s “Weatherman” album and “The Layover EP”, DJ Babu’s beat tapes and his “Likwit Junkies” album with Defari and Iriscience’s “Crown of Thorns”) These dudes are like hip hop’s Voltron and with Ev dropping his sophomore album “Cats and Dogs” I don’t know about ya’ll but I’m not expecting a sophomore jinx by any means. The “Liner Notes” produced by Alchemist and featuring my fave new soul singer Aloe Blacc sets off the project lovely, “One liner flow/see it in my liner notes/the kinds of ideas make it seem like the thought took 365 nights/I picture the high life/poolside made my own terms from lonely nights." "Strangers”, “It Wasn’t Me” and “I Don’t Need Love” stay in the same boom bap vein that we’ve all come to expect from Ev and “Fame” featuring Roc Marciano and Prodigy is a fresh out the oven banger. Primo checks in with the first single “You” as well “The Epilogue” and both tracks should help settle some of that “Primo fell off” noise but the highlight of “Cats and Dogs” is easily Ev’s best friend, Alchemist. Al checks in on this project with only 5 tracks but those 5 tracks literally help to make this album the banger that it is. “Jimi Hendirx” has the Step Brothers (Ev and ALC) going back and forth on some EPMD ish, “Where You Come From” featuring Rakka, Termanology is crazy and “Crash” just doesn’t make any sense at all. But the gem of the album, the banger, the track I literally listened to on repeat for an entire day is “The Red Carpet” featuring Raekwon and Ras Kass. Words can’t even begin to explain how dope the song is. And the way Al starts the song off letting us hear what the original sample sounds like and then what he did to it…it’s like money is just showing off for the hell of it. The crazy thing about Evidence is I actually know a lot of people who don’t mess with him. Some say it’s his voice, other say it’s his flow but I can’t call it cause Ev is dope to me. With so many people beefing about hip hop’s dead and not being able to find any “real” hip hop out here, calling Ev wack to me is like looking a gift horse in the mouth cause Ev’s “Cats and Dogs” falls right in line with the Dialate lineage…and PLEASE tell me who could be mad at that?